William & Mary set consisting of one armchair and six sides, New England, 1730. 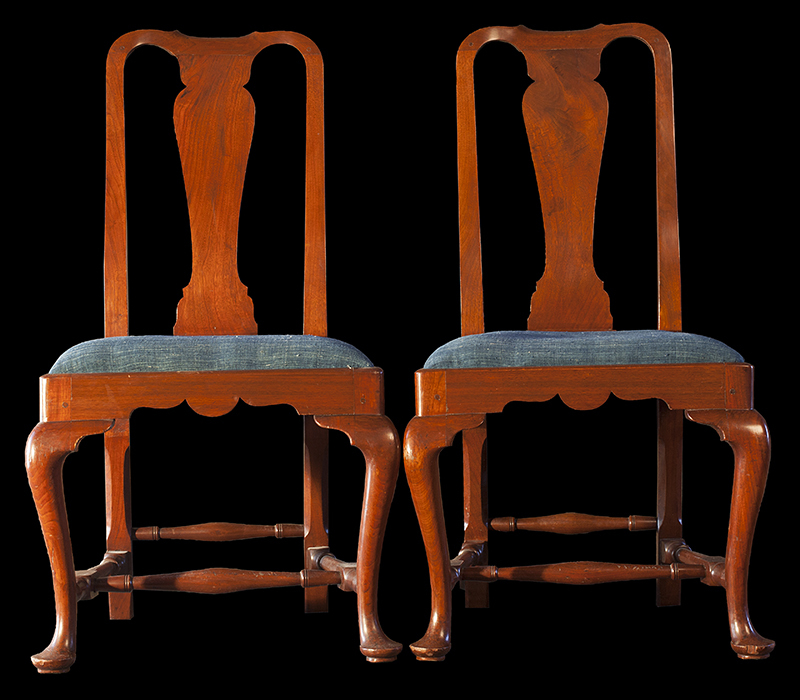 These chairs are distinguished by the scrollwork on the aprons, proportions on the arms and splats, original finish, and original rush seats. They are made of cherry. Leigh called me a couple of years ago and said recent analysis suggests they may have been made by John Gaines. 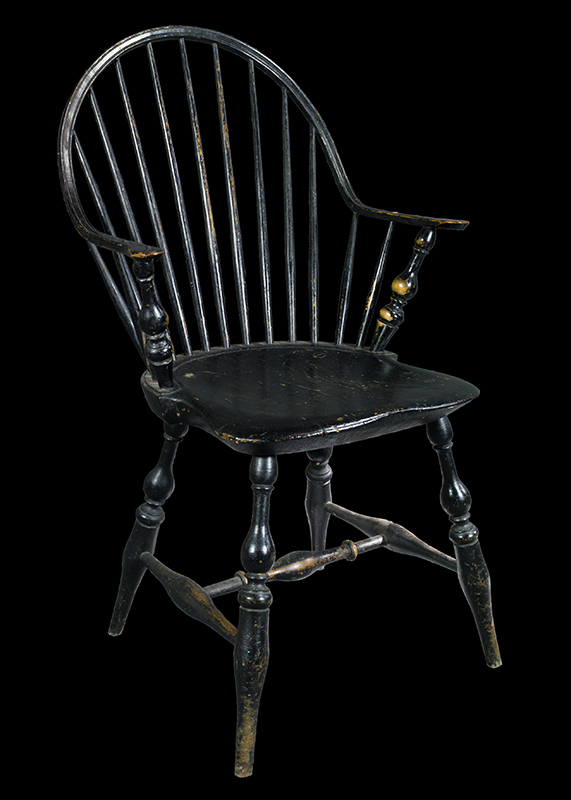 Having seen the cabriole-leg chair from the same shop listed below, Zeke Liverant was convinced they came from Connecticut. The choice of cherry wood in all these chairs makes this a possibility, but most folks who have seen them think these are from New Hampshire. Recent discussions with Arthur Liverant suggest a striking similarity to a group of objects from northern New London County, CT. In particular, the scrollwork on the apron and form of the legs are virtually identical to case pieces attributed to Isaiah Tiffany from Lebanon, CT (1697-1780). Tiffany's account book also documents his chairmaking and seat repairs. At this point, all we can say is New England. A definitive attribution may come later, but for now the quality speaks for itself. 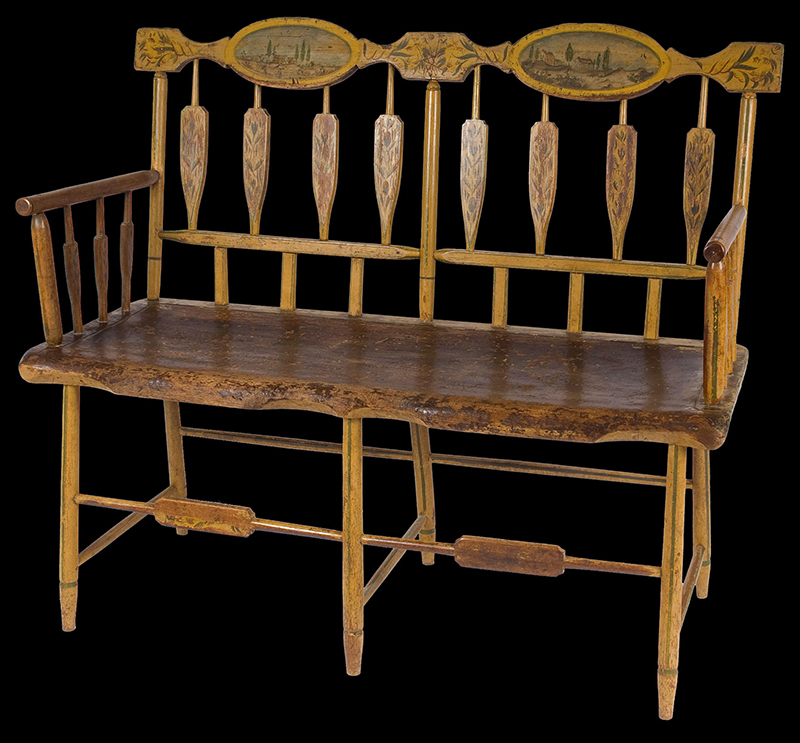 In this period it was common to have such an odd-numberet set, with the armchair reserved for the master of the household and the others flanked to his left and right. This harkens back to earlier medieval seating protocol at refectory tables, the most famous example of which was Leonardo's The Last Supper. "(plate) 2103. 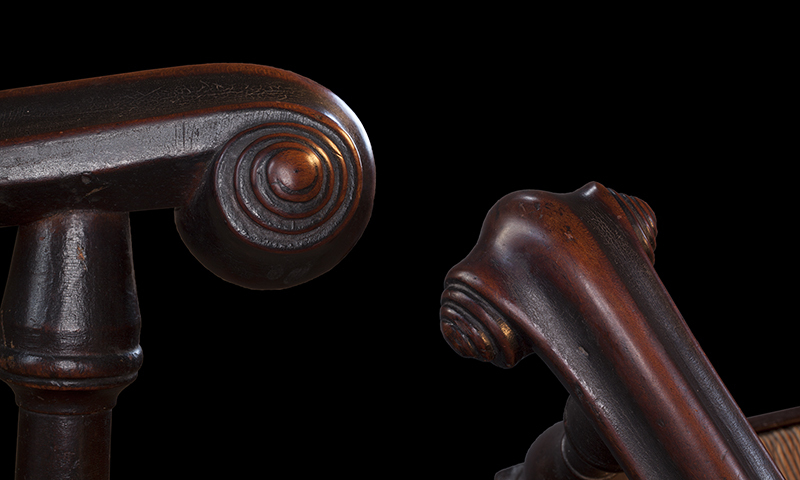 A Rare Type with Ribbed Arm Ending in a Spiral, Scrolled Skirt, Carved Saddle Back. 1710-30. Henry R. Davis, Everett. 2104. A Side Chair of the Same Set and Belonging to the Same Owner." 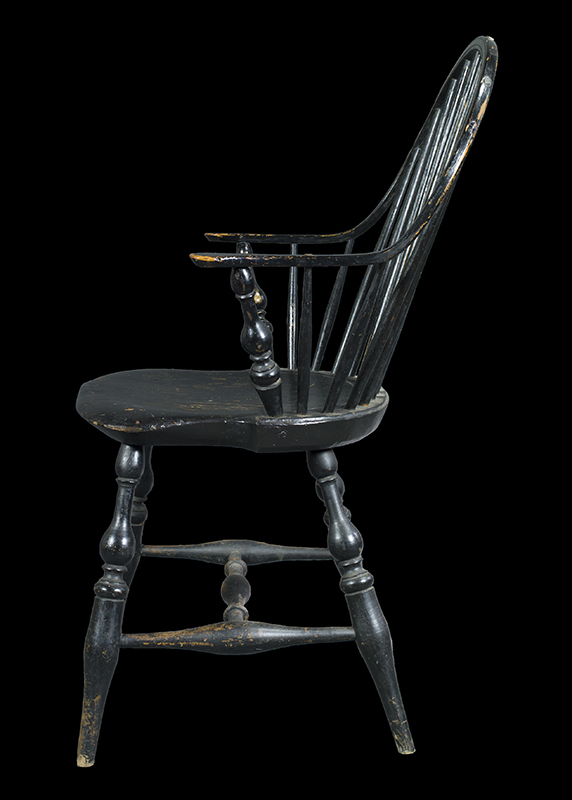 Queen Anne side chair, New England. 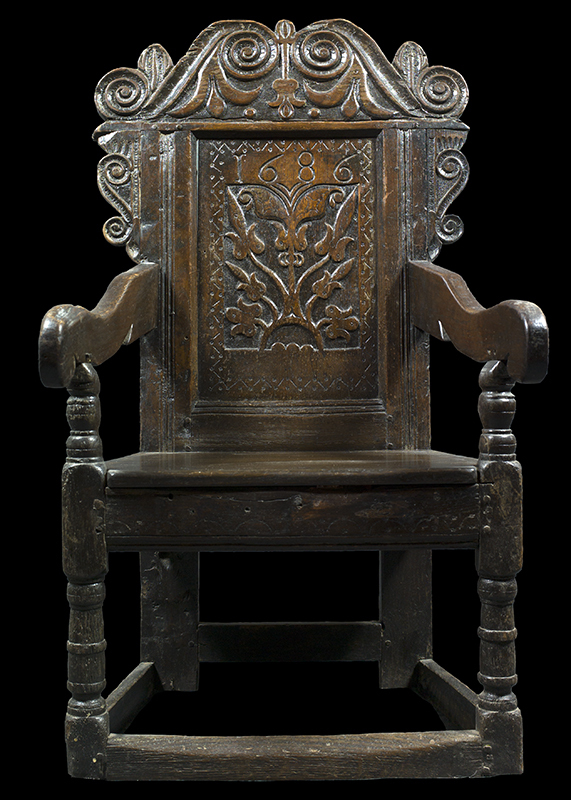 This chair is obviously from the same workshop, sharing the characteristic scrollwork on the apron, as well as identical crest, rear leg, splat, and shoe moulding. 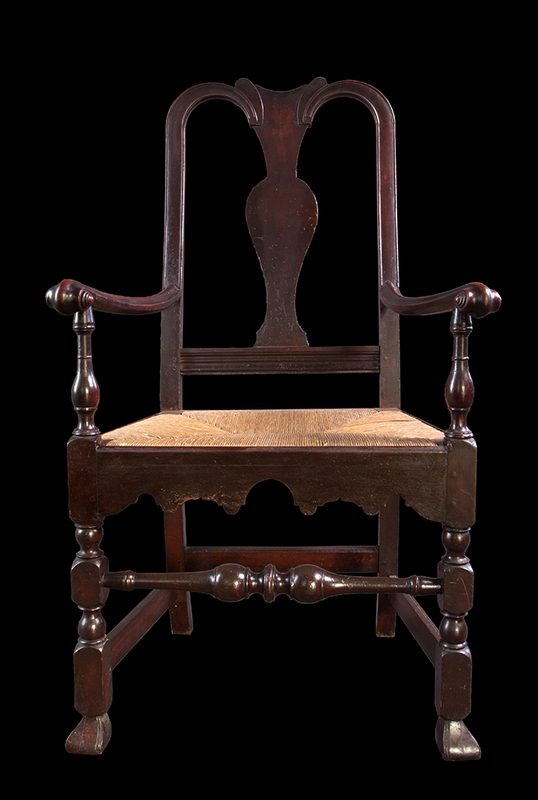 Of course, this chair has the Queen Anne cabriole front legs. 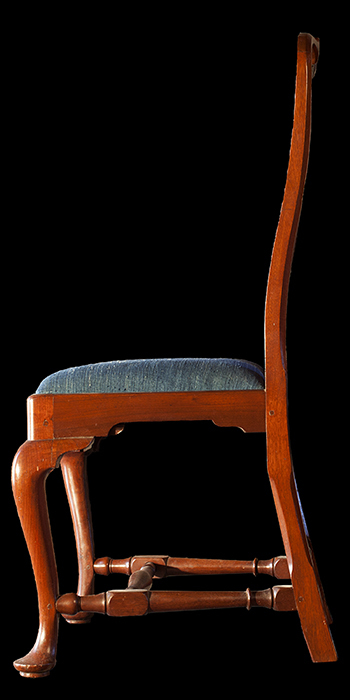 At that time, chairs could be ordered with choices in leg design as preferred by the customer. 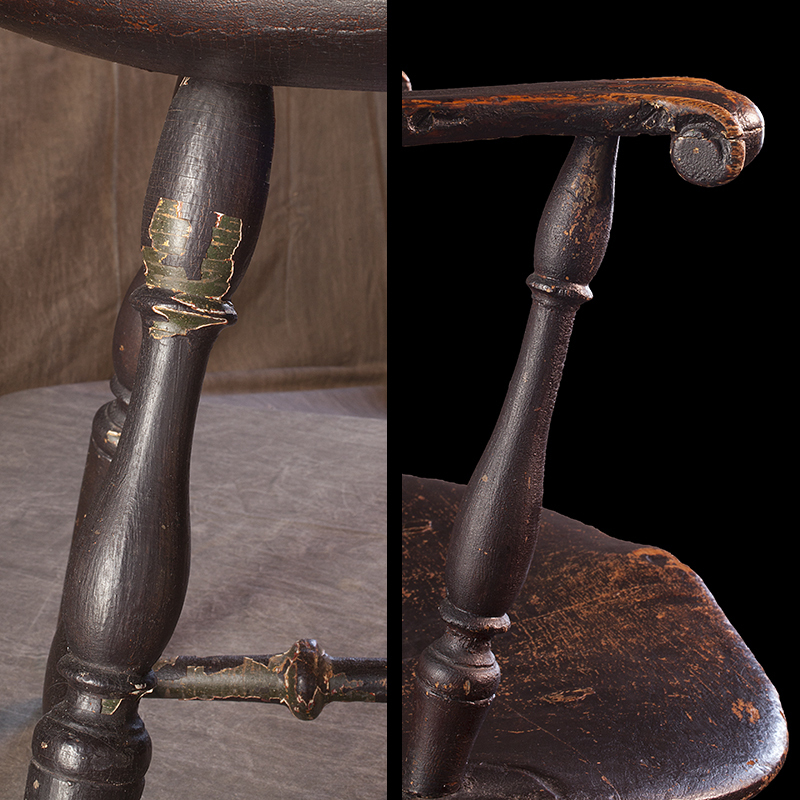 Our chairmaker had a wonderful sense of proportion and flow, as can be seen in the transition from the apron to the knee returns and overall shape of the front legs. 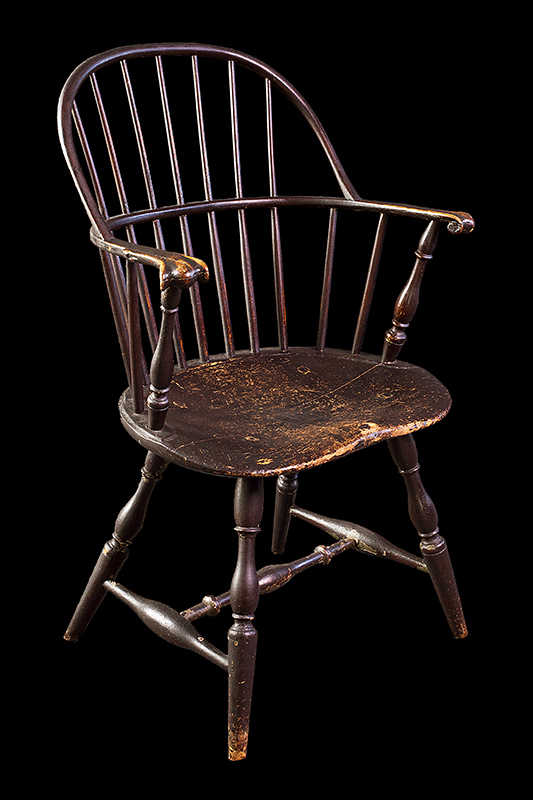 I saw this chair in an ad in the Maine Antiques Digest, and immediately left a message for the dealer in the midwest. He called me back the next day and told me he purchased the chair from a picker at the Heart of Country show in Nashville, but had passed it on up the food chain the day before I called to another picker heading to New York for the big winter antiques show. A quick call to Leigh Keno was all it took to track the chair down. Sam Herrup was about to set it up in his stall. I made the deal through Leigh, and it was ours! There is no telling how much money that 24-hr delay cost me, but I have already been offered much more than I paid for the piece. I remembered Titi Halle showing me the Massachusetts "onion" flamestitch fabric at Cora Ginsburg's in New York a couple years earlier, and realized it would be a great match for this exceptional chair. Fortunately, she still had it. 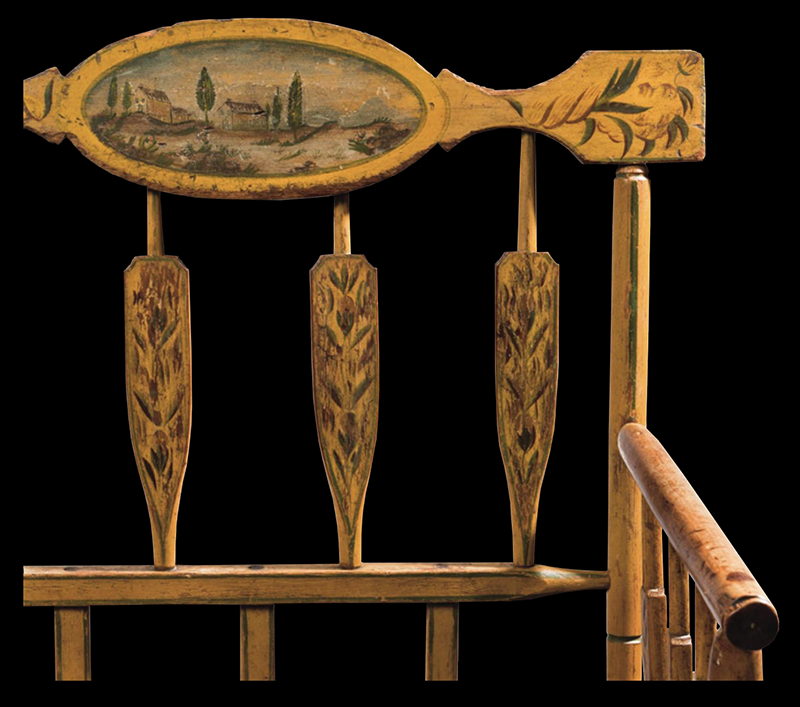 Hickory, poplar, and maple, with original painted decoration, 36½ x 43 x 16¾ inches. Provenance: Collection of Mr. and Mrs. Charles H. Gershenson, Grosse Point, Michigan; “The Charles H. Gershenson Collection,” H. O. McNeiry, Stalker & Boos, Inc., Auctioneers, Detroit, Michigan, October 23, 1972; Don Walters, Goshen, Indiana: Collection of Mr. and Mrs. Ridgley W. Cook, Winnetka, Illinois. Published: Doris Fisher Gershenson, “Living with Antiques, The Detroit home of Mr. and Mrs. Charles H. Gershenson,” The Magazine Antiques, May 1967, p. 641. Nancy Goyne Evans, American Windsor Furniture, Specialized Forms (New York 1997), Fig. 1-89. P. 121. 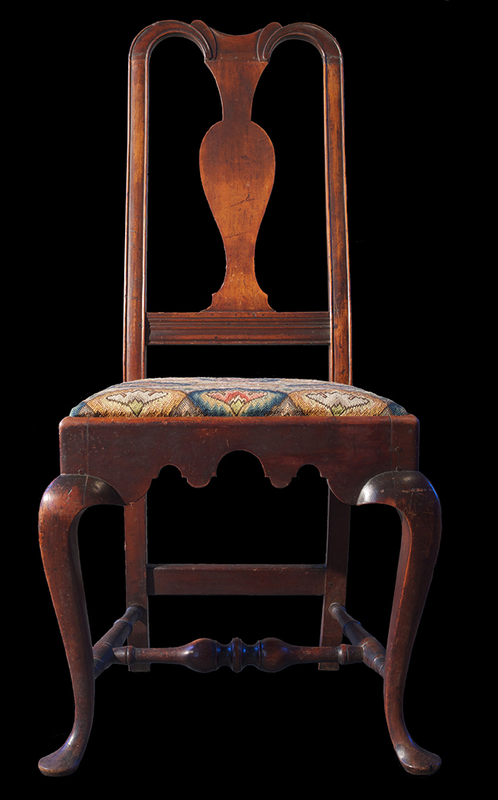 Sack back Windsor armchair, Connecticut, 1780. Purchased from Liverant and Son. Zeke loved to talk, and was happy to teach and share. On a couple of Boston trips, I drove down to Colchester daily just to talk to him and explore the shop. I'm sure he was culturing a customer for future sales, slowly reeling me in, but he would've been satisfied to just let me browse and absorb his knowledge. Zeke sat in this chair almost the whole time during my last trip. A few days later, I called and bought it out from under him. Later on, while Bonnie and I were watching Antiques Road Show,, they aired an interview with Zeke sitting in our chair! Sadly, he passed away soon afterward. I have met quite a few characters in pursuit of collecting, and Zeke was one of the best. Despite his disability, Zeke took me upstairs to look at a rare Connecticut butterfly table. We sat up there the better part of an hour going over the details. On a trip a few years earlier, Zeke and Joanna gave Bonnie and me a tour of their wonderful home. As might be expected, they had gathered up an amazing collection. Being a fly fisherman, I was also envious of their spring-fed pond with his huge pet trout. 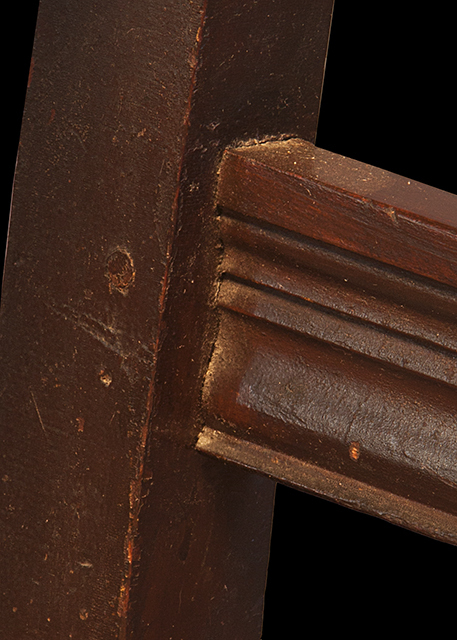 (L)The original green paint lies under 19th century black. 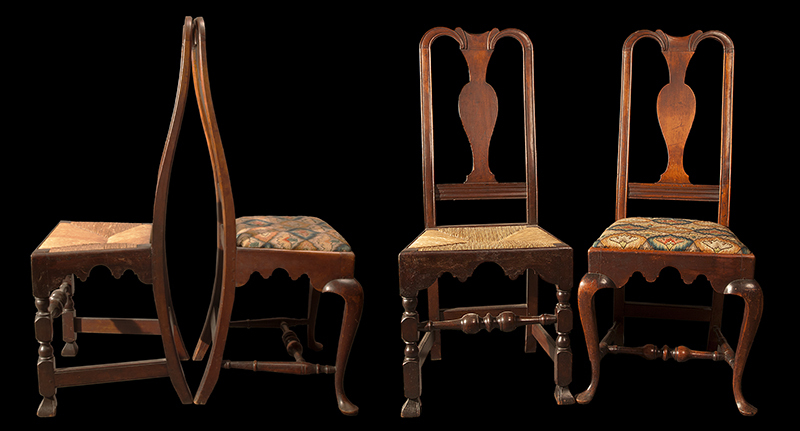 Pair of Queen Anne side chairs, walnut, Massachusetts, 1730-40. Chairs purchased from Robert Sack, New York. Period fabric from Cora Ginsburg, Inc. 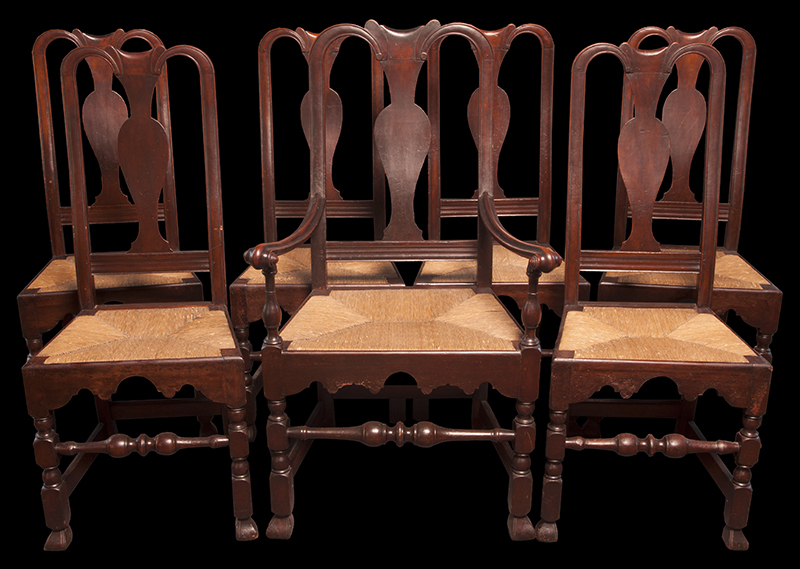 The backs on Queen Anne chairs like these are nicely contoured and quite comfortable. This pair is constructed of very dense, old-growth walnut. They are remarkably sturdy, considering they are over 270 years old. Purchased from Robert Brown and Richard Tanner. The seat and "ear" on the right side below the crest rail are replaced and the feet have been ended out, but look at the rest! Sometimes we just have to live with problems. So what if the old lady has had a joint replacement or two? She can still look good at the dance. Purchased from Samuel Herrup. The continuous arm is uniquely American, and one of the most successful of all Windsor designs. A similar armchair is pictured in Santore, The Windsor Style in America (1981) p. 113 & 123. Height: 37”; seat height: 18”. Side view demonstrating the continuous arm construction.